I have done herb jelly in the past, Lavender chardonnay & Lavender champagne, but I really like the process that Vicky used in infusing the flavor by letting it sit overnight. With so many of us having such busy lives it's a great way to spread out the process over two days. Surprisingly there are many herbs that have such interesting and amazing tastes when they are boiled and then used in recipes. You may not know that there are several basils and a few other herbs that have a more "sweet" note to them; Cinnamon basil, pineapple sage, Lemon basil, Lime basil, Lemon verbena, and Chocolate Mint. I'm sure that you know of more! 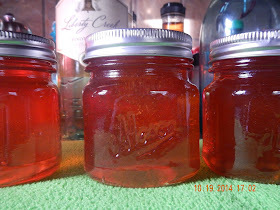 When Vicky posted these beautiful jars on my site I just had to share her process and the final recipe. 1 1/2 cups of the liquid. Cooking: Pour the herbal infusion (liquid) into a large cooking pot and add lemon juice or vinegar and the sugar. Bring to a hard boil, then add the liquid pectin and continue to boil for exactly one minute. Remove from heat and skim off any foam and discard it. 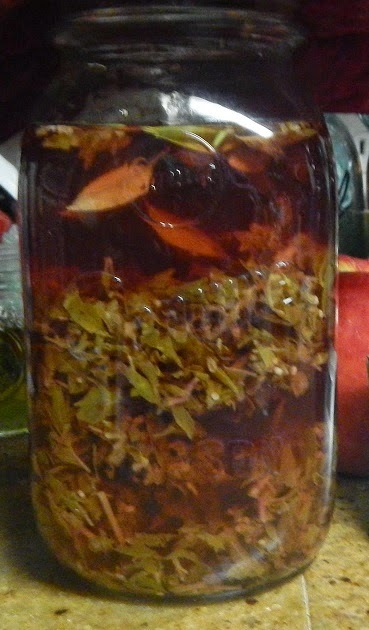 Filling the jars: On a dishtowel place hot jars and ladle into hot jars to 1/4" headspace in the jar. Remove air bubbles and adjust head-space, if necessary, by adding more jelly. Wipe rim with clean cloth or paper-towel, center lid on jar, screw band down till resistance is met, then increase to fingertip-tight.